In my years, I have put my hair through a lot + then some! I have colored my hair, cut it , grew it out, cut it shorter than needed, curls, relaxers…I’ve done some major alternations to the locks the good Lord gave me + now, I want to grow it out again and make it healthy! I have African – American, Multi-Cultured hair. My natural curls are very loose + my hair is very fine/thin. So about a year ago I cut my hair into a pixie cut. This was one of the shortest styles I had ever had + also the hardest to grow out. When I decided to grow my hair out, I started to wear extensions + weaves + after a while all the heat styling + relaxing to straighten my hair damaged it. My hair would break off + shed like you would not believe in the shower…OMG it was a complete hot mess! After a while I stopped relaxing my hair + using heat on it + just shampooed + conditioned it + continued with wearing weaves. This made the situation better but didn’t fix the problem. My hair was dry + still shedding like crazy but after about 8 months my hair had grown out from a pixie cut to shoulder length but, it was extremely damaged! I decided to relax my hair so that I could style it in a few ways but due to my hair being so fine, it just looked flat with no body or oomph what’s so ever. I decided to go to my local hair salon, HairMasters, + requested a cut that was not too short because I wanted to grow my hair out but enough to get rid of my dead/split ends + she did just that! My stylist got rid of all the dead ends + cut my hair into layers so it had body + bounce! A M A Z I N G!! My hair was now up to my ears but hey, it was the healthiest it had been in ages!! I made it a priority to take better care of my hair so I learned about co-washing as well as vitamins that would not bother me (due to crazy fillers). I started using Hair, Skin + Nails by this stuff has worked really well for me along with my hair care regimen. 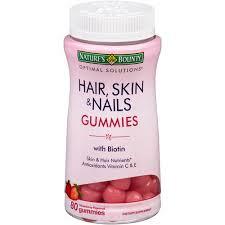 I chew 2 to 4 of these gummies a day + I have noticed a lovely amount of growth. I couldn’t put my hair in a ponytail when I first got it cut (05-06-2014) + after 5 weeks, my hair had grown 3-4 inches! I was pretty impressed with that. My hair is continuing to grow and I can’t wait to update on that in some time as well. 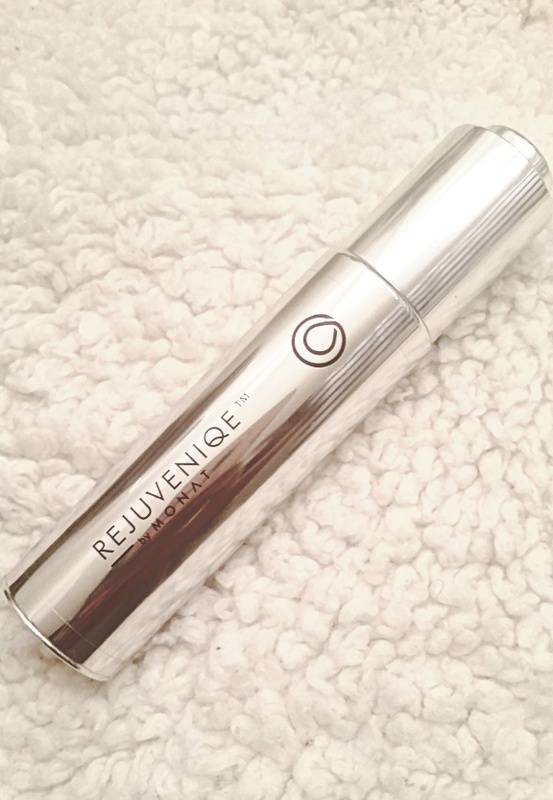 Now on to the good stuff…the actual routine! After I wash my hair I comb it out which feels amazing because based on the conditioners I use, I don’t have any tangles or knots. 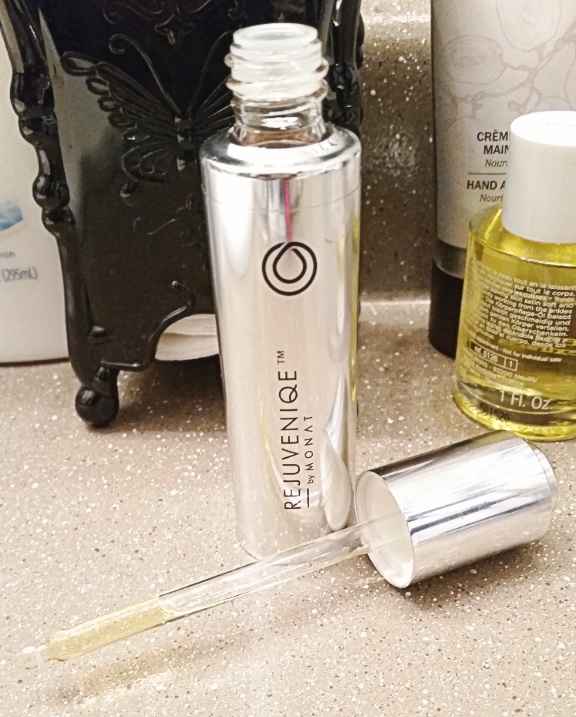 My hair feels so soft + silky…the feeling of healthy hair! 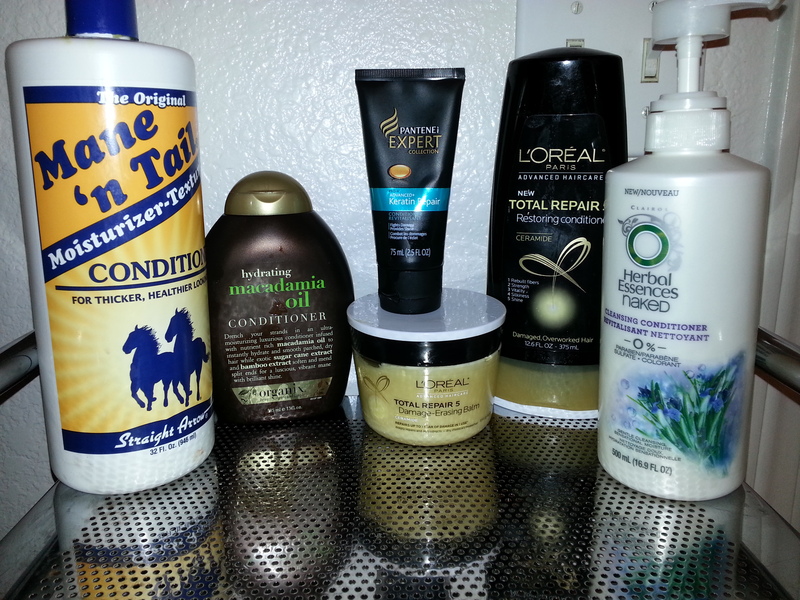 If I plan to let my hair air dry, I use the products in the photo below. 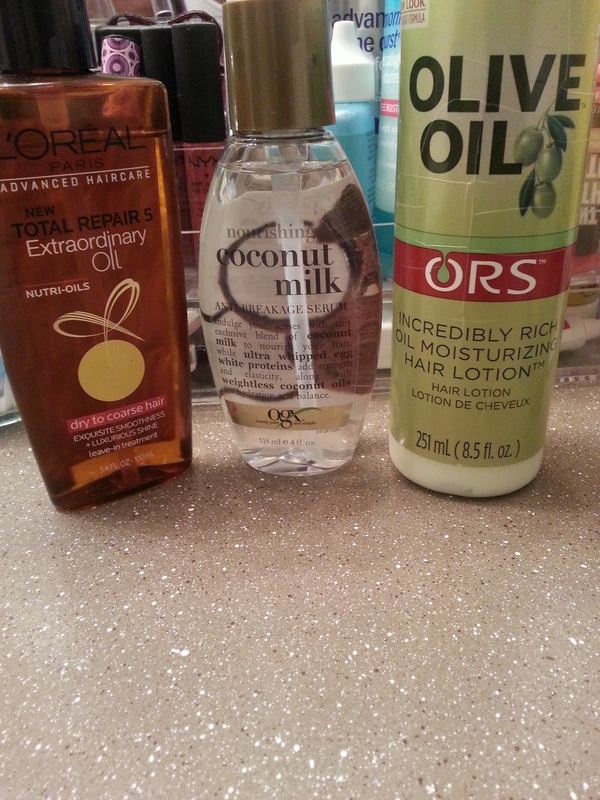 The oils keep my hair moisturized without build up + the oil cream helps my hair to hold shape when I style. The cream can cause build up so I try not to use too much. When I do blow dry or flat iron my hair, when it’s damp I use one of the oils on my ends + rub the remaining through my hair. 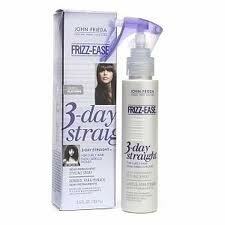 I also use the Frizz-Ease 3 Day Straight all over my hair, comb it through then blow dry + flat iron accordingly. I have realized that this method has cut down on heat damage significantly but I still only do this method about once or twice a month to be safe! All in all, this method I have started works great for my hair. I love the way my hair feels + looks now! My main goal was to achieve beautiful heathy hair + I feel that I am on the right track to achieving that goal! What’s your favorite hair care routine or product? 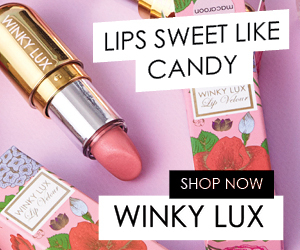 Leave a comment + let me know! !